Campaigners around the world are uniting for 16 Days of Activism against Gender-Based Violence, and there is significant activity planned for the Asia Pacific region. Our partners are taking part in a range of actions to mark 16 Days and call for an end to violence against women and girls. Here’s how some of our partners will be marking the campaign. 25 women’s organisations in Asia and the Pacific have joined forces to raise awareness of the impact violence against women has on women’s leadership opportunities. The Our Voice campaign is led by partners involved in IWDA’s Women’s Action for Voice and Empowerment (WAVE) program, which focuses on increasing the representation of women in diverse leadership positions. The Our Voice campaign for 16 Days of Activism encourages people to sign a pledge declaring they will raise their voice to end violence against women, and support women who are leading action in this space. Women’s League of Burma commenced their 16 Days of Activism with a day-long event in the Sagaing Region. 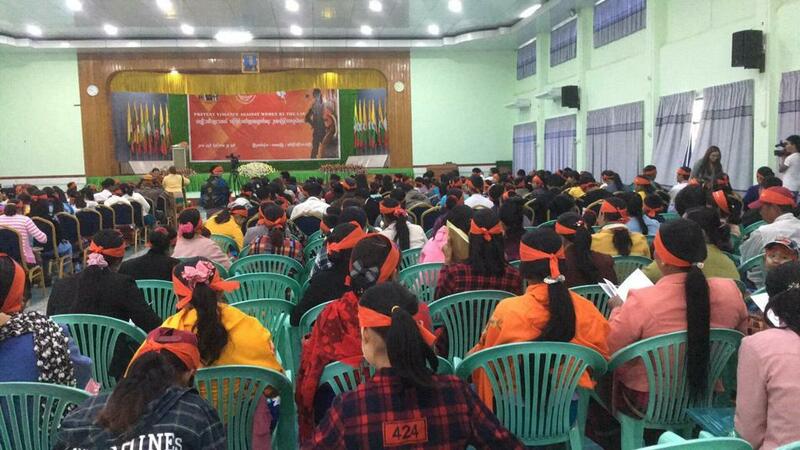 IWDA partner Women’s League of Burma commenced their 16 Days of Activism with a day-long event in the Sagaing Region. More than 500 people attended the event to learn more about actions they can take to prevent gender-based violence in their communities. IWDA partner Shan Women’s Action Network (SWAN) is a network of Shan women actively working in Shan State, Kachin State and Sagaing Division in Myanmar, and Northern Thailand. Their mission is to work towards gender equality and justice for ethnic women amidst the struggle for social and political change in Myanmar. Throughout 16 Days of Activism, SWAN will be running an online campaign called #WhyNoWomen, calling for increased representation of women in issues of peace and security. Each day, the group will share a reason for women’s exclusion from peace processes, and a recommendation for how to improve the situation. You can follow SWAN on Twitter for updates. Voice for Change staff finalise preparations for their 16 Days of Activism activities. 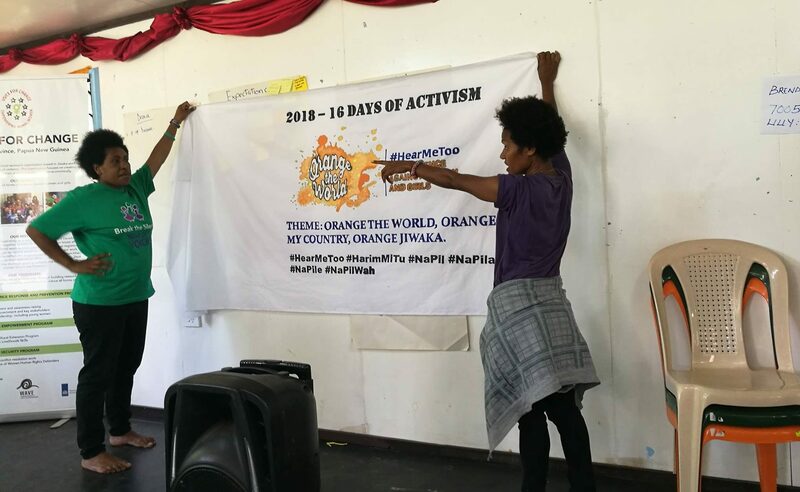 IWDA partner Voice for Change will work with participants of their Young Women’s Empowerment and Mentorship Program to lead their 16 Days of Activism program in Jiwaka Province, in the highlands of Papua New Guinea. A group of 25 young women successfully completed various modules within the program, which focused on gender-based violence, sexual and reproductive health, and activism. As a result, young women have increased their skills and confidence and feel empowered to join Voice for Change in their campaign for gender equality and safe communities. This year, together with Voice for Change staff and women leaders from the Jiwaka Women Human Rights Defenders Network, young women will be leading awareness-raising activities in local communities during the 16 Days of Activism. Our partner Christian Care Centre (CCC) is the only organisation in Solomon Islands that provides medium-term shelter and support to women and children affected by violence. Operated by nuns, mostly from the Anglican Church, CCC provides crisis accommodation and psychological first aid to women of all races and faiths. CCC will be reaching out to community members during the 16 Days of Activism to start a public conversation on violence against women. They will also hold a special church service called Break the Silence to raise the call for an end to gender-based violence. Another of our partners in Solomon Islands, Family Support Centre, will have staff and volunteers running activities in more than 10 locations. Their activities will include marches, public speeches, church services and workshops. Our partner Fiji Women’s Rights Movement (FWRM) is campaigning to stop sexual harassment in the workplace this 16 Days of Activism. A recent study by FWRM found that one in five women had experienced sexual harassment in the workplace, and that 82% of cases go unreported. You can learn more about FWRM’s ‘Not OK: Stop Sexual Harassment’ campaign on their website. Women’s rights organisations in Fiji will also take to the streets on December 10 for the Human Rights Day March in Suva. Members of the We Rise Coalition will be part of the action, calling for safer spaces for women and girls. IWDA partner Gender and Development for Cambodia (GADC) will be taking the call to end violence against women to local schools during 16 Days of Activism. GADC will join a wider campaign in Cambodia which brings together male advocates campaigning for gender equality.